Mallory and Zede are beyond excited to introduce the first SewHere Pattern! That’s right, we have patterns now. 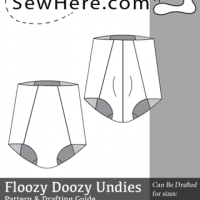 We are pleased to introduce you to the Floozy Doozy underwear pattern. This pattern is what Zede and Mal would do if they were in your sewing room with you and you wanted an underwear master pattern drafted. This pattern is a block with whole size numbers to draft to so you can get your perfect fit. Zede says the question she sees on Facebook in the SelfSewn Wardrobe group that bugs her the most is pattern suggestions for x,y,z that fits. She states that this question’s answers are a false reality because every body is different. So even if you have the same shape and height and weight as someone else your proportions could be different, tissue can be firmer or softer, and general preferences for how things fit will be different too. Mallory and Zede both agree that pattern companies are not evil and not the enemy. They do the best they can to fit the masses. They feel that their pattern system will bridge the gap between patterns and drafting and offer a better fit from the get go. Zede describes the Floozy Doozy as the first of many in this system of patterns. Future SewHere patterns will follow this draft style as well but there will be style components too. For example different necklines, different heights, additions and subtractions like with sleeves will all be available. How do you translate drafting/pattern ideas from paper and pencil to the computer? Mallory takes lots of classes, reads some books, and has some trial and errors – that’s how. She has it down now. This is not necessarily a new process but a blend of processes to get a really subtle change in pattern sizes. On the Floozy’s you can have a 20″ – 48″ waist and a 31″- 59″ hip. These numbers don’t have to correspond either, so the 20″ waist does not have to draft the 31″ hip. That’s the beauty of this pattern system. You plot your measurements to get exactly what YOU need. Pattern companies draft their patterns following certain industry standards and rules – like 11″differences between all waist and hip sizes or a certain percentage of negative ease. This information is not generally given to the consumer. We tell you all of the relative information like percentage of negative ease in the pattern as well as giving you all the whole sizes in 1″ increments. That’s right – we don’t skip any numbers. What if you are a 1/2 inch? We tell you to draft between numbers or will suggest if rounding up or down is appropriate – yep we are that awesome. 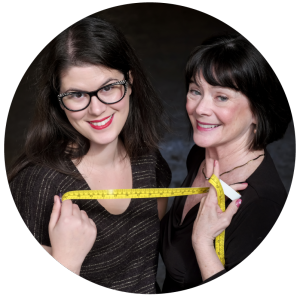 We want you to be successful and make garments that fit. There are some straight sizes delineated so you can see the general shape of the garment – this will help give you guidance when drafting between sizes (dots). Once you get this first draft done – no mods yet please, you will have a low leg, high waist, 4 panel bottom. Once you have your lower torso covered with this muslin you can make them however you’d like. Lower that waist line, raise the leg, add a woven front panel, any combo you would find pleasing.